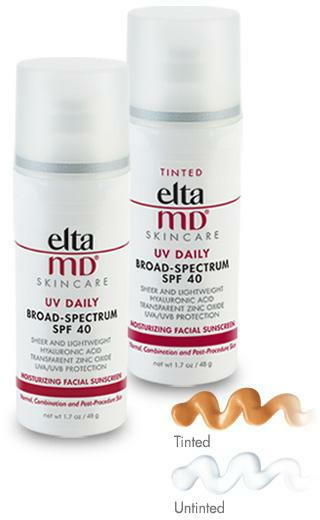 The Elta MD UV Daily Tinted sunscreen is a new product that provides both outstanding hydration and sun protection and is available now at A E Skin. With an SPF value of 40, it provides good sun protection for everyday use and it has both UVA and UVB protection. Unlike other sunscreens with high SPF values, it’s active ingredient is transparent zinc oxide, so it does not leave a thick white residue on the skin. The light tint makes it perfect to use as foundation so you do not need to apply as much makeup. It also contains hyaluronic acid, a humectant or hydrator, which draws water into the skin keeping the skin moisturized and preventing wrinkles. Many people use the product as a combination of moisturizer, sunscreen, and foundation all in one. The Elta MD UV Daily Tinted sunscreen glides onto the skin easily and is absorbed quickly, so makeup can be applied over it right away. It has not fragrances or parabens, and it is non-comedogenic, which means it does not cause acne breakouts. Stop by A E Skin to purchase this new and exciting product.